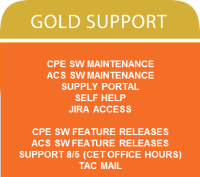 With the Gold service support level, Tilgin takes a larger responsibility for operational efficiency. Improved lead-times in all deliverables. Increased Tilgin responsibility in which Tilgin assumes more risk. Adds another communication dimension with the Technical Assistance Center (TAC) on top of already provided JIRA tool.